We install French doors across Dunfermline, Edinburgh, Stirling, Perth, Dundee, Fife, Rosyth, Glasgow and surrounding areas. Our French doors are equipped to serve the modern homeowner. They’re selective in the type of light they let through – so you can reap all of the benefits of more glass and better views without having to make unnecessary sacrifices. We also make a point of assembling our products from sustainably sourced materials, which means your new home improvement project doesn’t have to be a burden on the environment. It’s never been easier to enjoy the highest standards in a sustainable way. French doors are the ideal option for bringing a European flair to your home, capturing a crisp and clean look that complements any property style. Whether your home is new or old, you’ll be able to bring a door that looks beautiful. 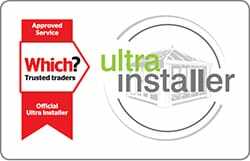 Further to this, we pride ourself on our installation standards. With 25 years of experience in the industry, we have been able to refine our service over the years to ensure we always deliver the highest degree of professionalism and reliability across the board. Our French doors are manufactured using an intelligent five chambered profile, which helps to trap in pockets of warm air to keep your home warmer for longer. With this in mind, you could find yourself spending less on your heating bills across the course of the year, as you rely less on your central heating to keep you comfortable during the colder winter months. It also works to reduce your carbon footprint through reduced energy use. As French doors feature a double door design, alongside a flying mullion, they offer unobstructed access when fully opened. When this factor is combined with a low threshold, you’ll be able to enjoy simple and easy access to your home. This also makes these doors the perfect option for wheelchair and pushchair users who require heightened accessibility. 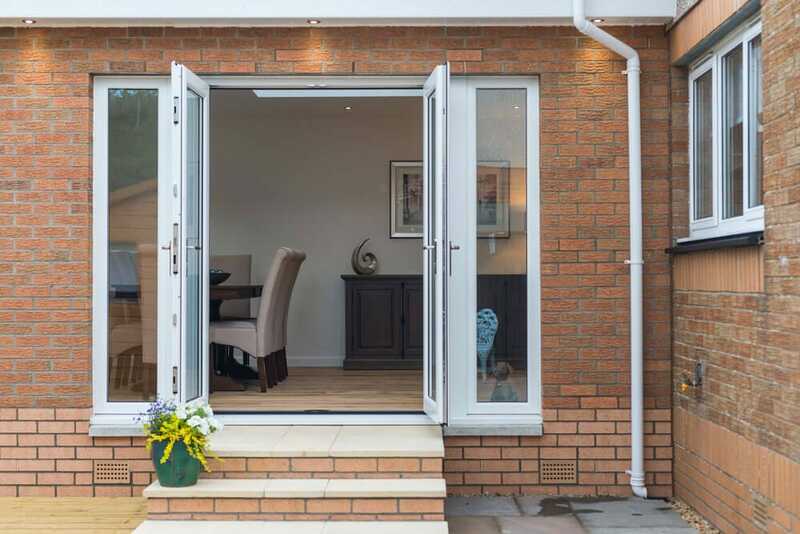 As draughts and water ingress can have a negative effect on the comfort of your home, all of our French doors are fitted with low line gaskets and weather seals to ensure your property is protected against any adverse Scottish weather. Due to their discreet design, these seals and gaskets don’t compromise the look of your door or home. We know that bringing a personal touch to your doors is essential to making them feel like part of your home. This is why we offer you an extensive range of colours and finishes, whether you’re looking for the timeless and popular white finish, or more of a heritage feel with a woodgrain foil, we’ll be able to offer you something perfect. The multi-chambered design of our French doors allows them to achieve an impressive standard of inherent robustness. This structural integrity is then enhanced with steel reinforcement where needed, which adds structural strength to your door. Both of these features are combined with high security locking systems to ensure the highest standards of security. Unlike timber and outdated doors, our French doors will offer you an impressive lifespan. The premium grade uPVC that is used in the manufacturing process of our French doors allows them to be impervious to swelling, bowing, warping, rotting or cracking over the years. You’ll be able to install something in your home that continues to bring performance time and time again. When you choose French doors from SRJ Windows, you’ll be able to enjoy leading standards of quality without any of the headaches that come with maintenance. To keep your doors looking as good as they did on the day that they were installed, all you have to do is give them a quick wipe down with soapy water and you’re done! You’ll be able to enjoy that ‘as new’ look for years to come. The slim profile of our French doors is achieved through a modern design, achieving impressive performance without the bulk. This, in turn, allows you to enjoy larger panes of glass that bring increased natural light allowance and enhanced views. They are a beautiful way to bring a bright and spacious feel to your home, while still keeping the elements at bay to remain comfortable. We want you to enjoy your new doors as soon as possible, without having to sacrifice quality or service. All of our expert teams are well versed when it comes to the installation of our French doors, so you can be sure of a prompt and professional service that gets the perfect fit every time. You won’t have to settle for anything less when you choose SRJ Windows for your French Doors. Get in touch with us via our online quoting engine to get a free, instant and competitive online price. We’ll be able to offer you a bespoke quote, or you can get in touch with us should you have any questions about our products. Our Fife showroom is also a fantastic place to come and see our French doors in person. We look forward to helping you to find the right French door for your home.